What Kind of Habitat Do Peacocks Live In? The tropical forest is dry, but the air is sticky with the nearness of the river and the coming rains. Dead leaves crumble underfoot, returning their substance to the baked soil. Suddenly, leafless branches thrash close overhead; insect murmurs and monkey chatter go silent; there's a raucous scream. A murder? An ape? Nope. It's a peacock. 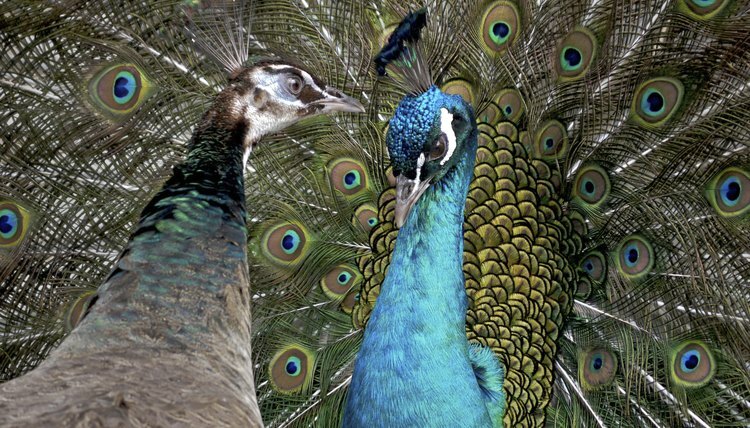 The classic blue Indian peacock’s unique claim to fame is his magnificent arc of 3-foot tail feathers in gleaming metallic colorts, each topped by a brilliant eyespot placed there, legend says, by an ancient Greek goddess. The truly spectacular white peacock is a genetic mutation that occurs in the Indian blue. The green peacock, a brilliant green who comes from Java, Burma or Indochina, is rare and endangered. The Congo peacock is much less colorful than his distant relatives. Very little is known about him. Peafowl prefer warm climates. Their ideal habitat is an open tropical seasonal forest with trees for roosting. They usually settle near all-season water sources such as rivers and creeks. They also like living within a convenient distance of vegetable gardens and fruit orchards, but not too close to humans. To keep a muster of peafowl -- one peacock and up to five peahens -- in an enclosed space requires a minimum of 80 square feet per bird. The enclosure should be landscaped with bushes and shrubbery to provide hiding places. It should be protected from digging predators by underground fencing and from climbing predators by high fencing. Protect against escape and against flying predators with a covered top and perhaps even an electrified wire barrier to deter large intruders. The birds need a covered area in which to retire from rain or snow. If the climate requires it, provide an insulated or heated space. The captive habitat should contain a roosting area for the birds to sleep in. They fly into the trees to roost in the wild, so they need elevated perches to overnight on. Use wooden dowels with a diameter that fits their feet -- metal might freeze their feet in winter. Peahens nest on the ground in the wild, but in captivity they will use a communal nesting box if you'll provide one; remove eggs daily to encourage its use. Peafowl usually drink once a day in the wild, but caged birds need access to clean, fresh water all the time. A well-secured bucket will allow them to drink freely. As their omnivorous wild diet ranges from seeds and plants to bugs and snakes, an appropriate menu for a captive would include a grain mix formulated for game birds, or a commercial turkey food, mixed with fresh fruits and vegetables, insects such as crickets or mealworms, and a supplement mixture of crushed shells, gravel and appropriate vitamins. For a special treat, offer stale bread or dog kibble. Serve their food in elevated troughs or bowls, and clean up scattered leftovers to discourage pests. Yukozimo: What Do Peacocks Eat? Healthy Food List.org: What Is the Best Peacock Food?